THIS WEEK was meant to be a good-news week for Boeing: the American aerospace giant had planned to unveil its new long-haul 777X jetliner today. That had to be shelved after one of its new Boeing 737 MAX 8 jets crashed in Ethiopia, killing all 149 passengers and eight crew aboard. Tragedies of this sort do not usually spook investors in planemakers, but this one did. Boeing’s share price has fallen by 10% since the crash. 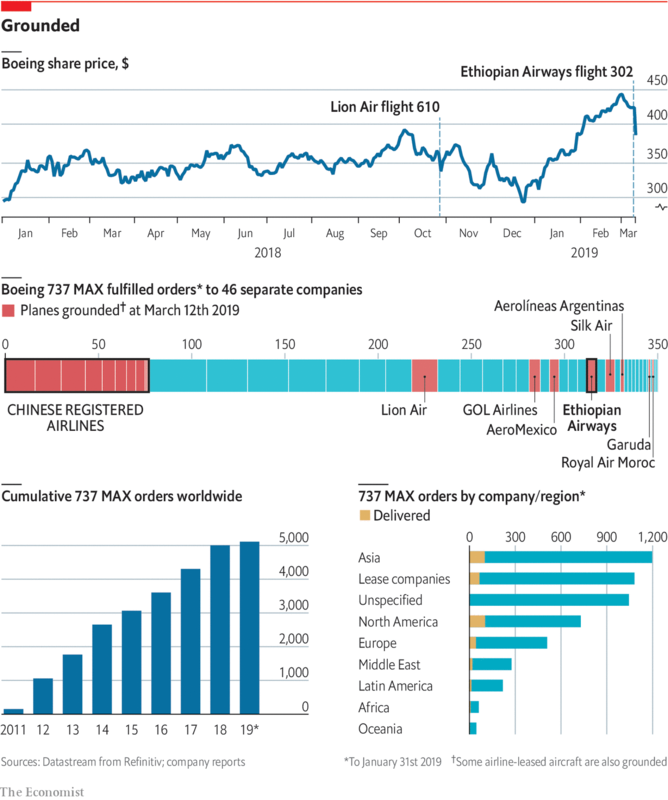 Similarities between the accident in Ethiopia and another one involving a 737 MAX 8 five months ago in Indonesia, which killed 189 people, have aroused suspicions that there might be a problem with the jet. Many aviation regulators around the world are taking no chances. China’s aviation regulator was the first to act, instructing its domestic airlines on March 11th to ground all their 737 MAX airliners. The authorities in Australia, Britain, France and Germany followed suit the next day, as did Europe’s aviation-safety regulator. That leaves one glaring exception: America’s regulator, the Federal Aviation Administration, continues to claim the plane is airworthy. Next PostNext Is modern monetary theory nutty or essential?